Are you ready for an adventure like you've never had before? 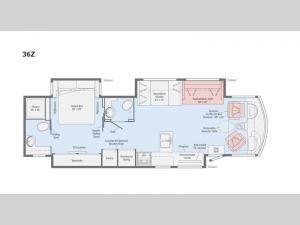 Pack up the family and let the kids invite their friends, with room for seven in this unit. This motorhome has three slides, giving you space like you'd have at home. The kids will love 50" HDTV for morning cartoons. For your own space, you'll appreciate sliding doors to the bedroom with a queen bed, nightstands on either side of the bed, and a 32" HDTV. This model features a kitchen that any chef will love which includes a two door residential refrigerator and freezer with an icemaker, a pantry for all the dry goods, and a microwave oven. With a rear bath and a bath and a half, your guests won't have to wait in line for their turn to go. This motorhome also includes a TruComfort + Sofa, for the kids to sleep, an electric fireplace, optional washer and dryer prep, and much more! Come see what you've been missing today! In every Winnebago Adventurer class A gas motorhome you will find a double stainless steel sink, and a three burner cooktop. 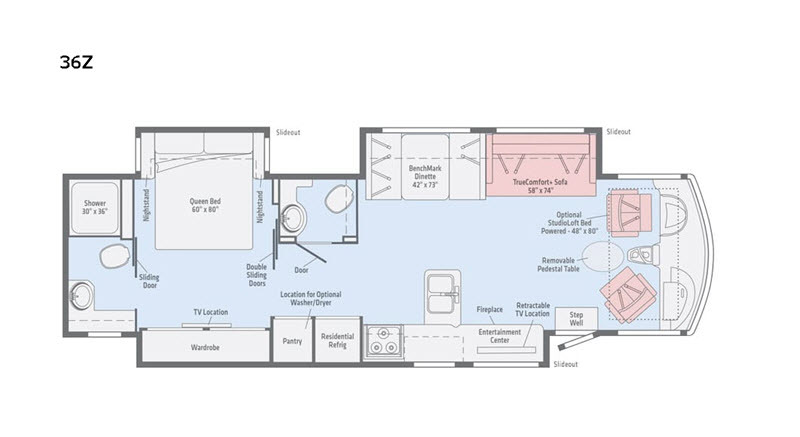 Each unit also features a bathroom skylight to make you feel right at home, and an optional powered loft bed. These motorhomes include ample storage areas, plus lighted storage compartments, making packing a breeze. These models include a powered patio awning with LED lighting, a pet leash tie down, and automatic entrance door steps. Constructed with a premium high-gloss fiberglass skin, and a Triton engine, the Winnebago Adventurer has been made to last. Come choose the best floorplan for your lifestyle today!